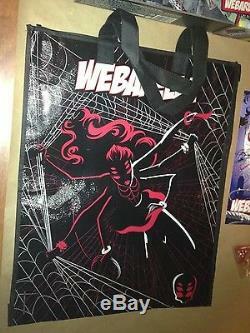 SAN DIEGO COMIC CON & NEW YORK COMIC CON 2013 EXCLUSIVE. 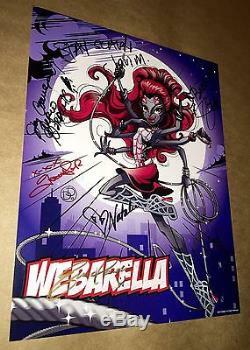 1 FULL CAST & ART DESIGNERS & CREATORS AUTOGRAPHED WEBARELLA 8" 1/2 x11" PRINT, 1 WEBARELLA 2 SIDED CANVAS BAG, 1 PAIR PINK JEWEL GLASSES, 1 MINI MONSTER HIGH POWER GHOULS COMIC, 1 MONSTER HIGH TIE & 2 MONSTER HIGH MINI COMICS THAT WERE ONLY AVAILABLE AT AN EXCLUSIVE 1 HOUR WRISTBAND SIGNING EVENT FOR ONLY 50 LUCKY GUESTS AT THE MONSTER HIGH BOOTH AT THE SDCC CONVENTION CENTER 2013. 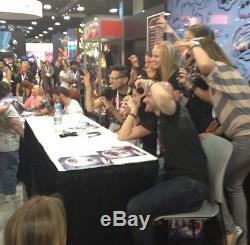 PLUS I WILL INCLUDE THE PICTURES ABOVE FROM THE SIGNING AS A COA. 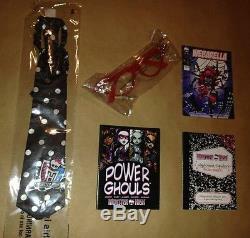 & SOME MONSTER HIGH SUPRISES! ITEMS ARE ALL BRAND NEW - ALSO INCLUDES THE DOLL PROTECTIVE OUTER BOX. DOLLS ARE FULLY ARTICULATED SO THEY CAN BE POSED IN MANY DIFFERENT WAYS. 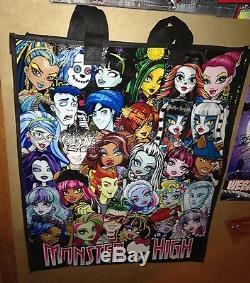 THIS IS A MUST HAVE FOR ANY MONSTER HIGH FAN!! This year's Monster High SDCC exclusive began as just a thread of an idea but it didn't take long before we were. Totally wrapped up in it. Now with no further spin, we are excited to reveal this year's doll; Wydowna Spider. 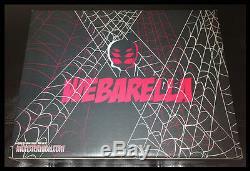 The silky smooth Daughter of Arachne, dressed in her costume as the Power Ghoul Webarella! MAKES AN INCREDIBLE GIFT FOR THE KIDS DURING THE HOLIDAYS! GOOD LUCK & HAPPY HOLIDAYS! 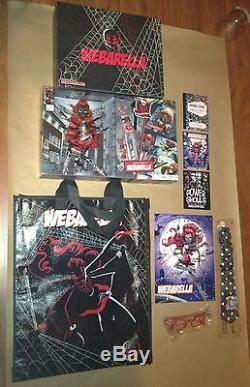 The item "SDCC 2013 MONSTER HIGH WEBARELLA WYDOWNA SPIDER MATTEL SIGNED PRINT & BAG SET" is in sale since Monday, November 2, 2015. This item is in the category "Dolls & Bears\Dolls\By Type\Gothic & Horror". 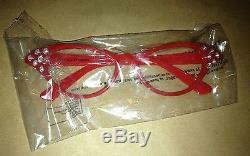 The seller is "wackyfunshop" and is located in Los Angeles, California.